If you play the game of art long enough, you’re gonna get dirty. To get the view I really wanted, I had to climb a steep rock ledge and crawl through the pucker brush. It’s interesting what we’re willing (and able) to do when it counts. Each month I draw one random Day in Vermont subscriber to win a free print. It’s one small (and fun) way I can say thank you for your amazing support. We currently have 6200 subscribers to the weekly email newsletter. When we hit 7K subscribers I’ll start drawing two winners each month. We’re getting closer! Please consider inviting a friend to Subscribe. 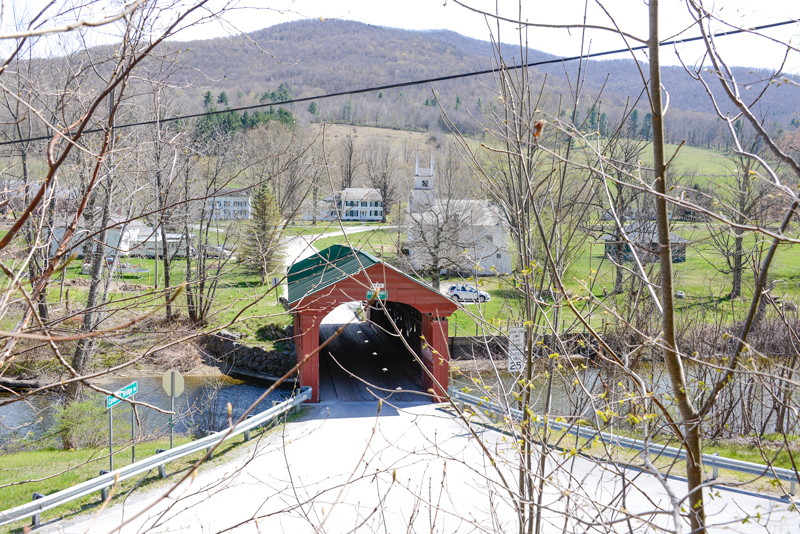 Our winner for May is Robin Reed-Cameron of Rutland, VT. Thank you for continuing to inspire us all Peter with your talents. Following your dreams and fulfilling them is part of life and we are blessed by the success you have had in this endeavor. We love you! So happy to finally be getting these weekly videos, Peter. Stay real. I’m happy too, Joel. I’ll have a painting each week for you, but the videos come along about once a month or so. And staying real?….my sense is that it only gets real-er from here. What an amazing art lesson! The way you describe what you do with your talents and then show us how you use those talents is such an inspiration! Where you started out and where you are now is so encouraging. You help us enjoy where we are in life and encourage us to look beyond ourselves and be productive in whatever we endeavor. Thanks again so much for this Monday treat! Smiles are good. Thanks Patty! Thanks so much Muriel, yes, we all have to start at the same place, the beginning. It’s a privilege for me to share my journey and a joy to know that it’s helping others in some way. Love your painting. Thank you for the video. You continue to inspire me with my art. it’s contagious, isn’t it? Thanks Susan! and have shared these e-mails with two budding artists in my family for a few years now. Thanks for sharing yourself in this way! Your poet’s soul shines in the paintings and also in your words. I’m grateful every day that I found my gift Judy, and even more grateful that it seems to be worth sharing. Many thanks! As usual, I enjoyed this week’s painting and video. You gave yourself quite a challenge this week between climbing through brush and then choosing a view to model which presented all kinds of perspective issues to tackle. Also, love the nugget of wisdom, “Until you start, you won’t start.” Well said ! Thanks Brian, much appreciated. Maybe one of the reasons we paint is that we love a good challenge. And yes, this was one. Perhaps the biggest for me was doing it in front of a camera. I am starting to get used to that, however. Nice painting! I remember that bridge! There seem to be very few subjects you don’t recognize David, thanks! Love the painting this week. 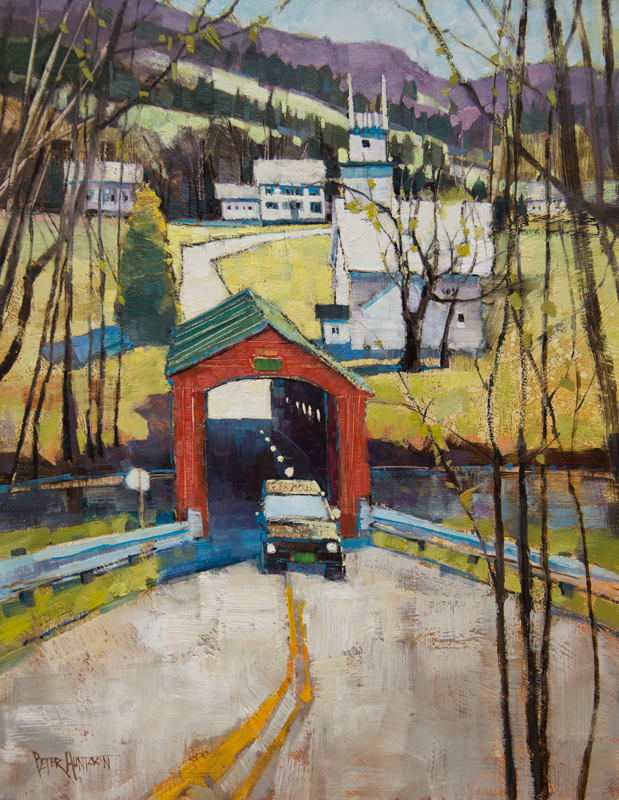 Living close to this bridge makes the painting special for me. Also enjoyed the video. We have spent many happy hours in the Epoch gallery. Epoch is filled with good energy emanating from all that great artwork, and the nice folks who come in. Thank you, Susy! 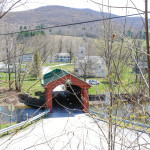 Love out bridge … a favorite spot! Once we pass a certain age we begin to encounter something called judgement, both internally and from countless external sources. Those pervasive (and persuasive) voices only grow louder as we get older. For the would-be artist, there is nothing scarier than a blank white canvas. It’s a good strategy to assert yourself right off the bat. It’s always going to be a dance with the devil, but you CAN take the lead. Thanks Doris! 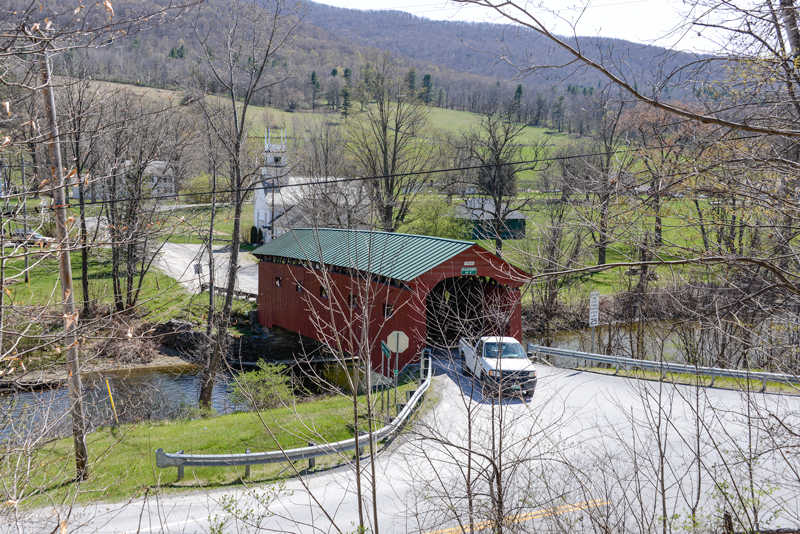 If walls could talk….our covered bridges might have a few good stories to tell. Thanks Cynthia! Beautiful painting!… and thank you for the video! You know it’s my pleasure, Steve. Thanks! I really enjoy your paintings and thanks for sharing. and he took me up there to see Vermont. certainly love to visit your beautiful state again. to do about getting one of your paintings…..
Hello June, and thanks very much for the note. Please just give me a call and we can chat. Many people think I have a staff or something, but it’s just little old me in my studio, and I’m ALWAYS happy to talk to nice folks about art. 802-235-2328. Thanks! Very inspiring work. Love the opportunity to see wondering scenes. Thanks Rose, glad you enjoyed it!